It is time to find the best curling iron for long hair! Long hair is the epitome of being feminine. Who doesn’t want a long head of hair that seems to blow effortlessly in the wind? But the runway-style, magazine-ready looks we all wish we had not come easily…or quickly. It takes time and effort, but that doesn’t mean it can’t be fun too. With a few quick tricks, you can save time, prevent damage, and have fun playing it! These three products we highly recommend to get your best curls ever. Let’s have a look! Barrel Size : 7 interchangeable barrels 1/2"" 3/4"" 1.25"" 1.5""
11 What is the Best Way to Curl Long Hair? The wand itself has 24K gold specs and other minerals added into its ceramic mix. This tends to spread the heat out over the entire length of the wand more evenly and add a moisture element into the mix to make your hair really shine. 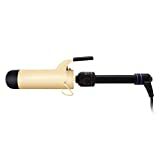 One of the unique things about this curling iron model from Bio Ionic is it doesn’t have a clip on the barrel to catch the hair. In actuality, this makes this curling iron more versatile than other models that do. That’s because you now have more flexibility to do such things as use it with longer hair or create a larger variety of curls. 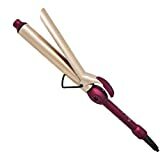 Once you factor in the negative ion technology that it uses to help reduce split ends and frizz, then you have a curling iron that makes magnificent curls but is easy on your hair. 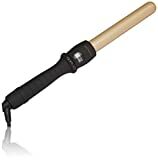 This curling iron can be a little tricky to use at first but once you master it you can do a variety of great looking and long lasting curls with it. 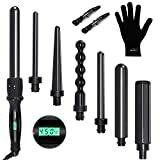 Just like the name says everything about this nicely designed and unique curling iron is big. It has big heat (up to 430 degrees Fahrenheit), a big long barrel (over 9 inches) and a big selection of heat settings to choose from (6). 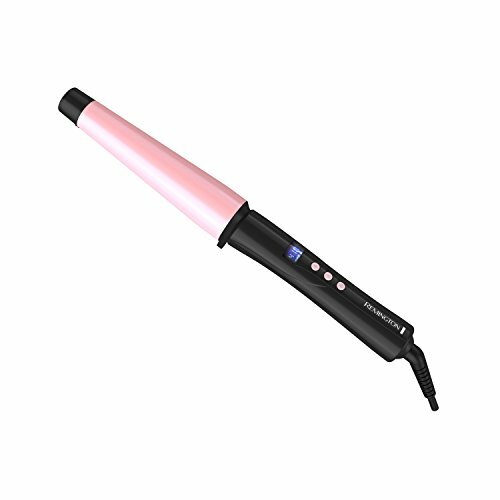 There are not many curling irons that have the size and high heat that this one has for sure. Does it work well or is it just a bunch of ‘big’ hype? It actually does a really nice job making all different sizes of curls on a large variety of hair types including long hair. Those with extra-long hair will love it because its longer barrel enables this curling tool to catch more hair on each pass and in-turn that shortens the time it will take to curl your hair each time you use it. 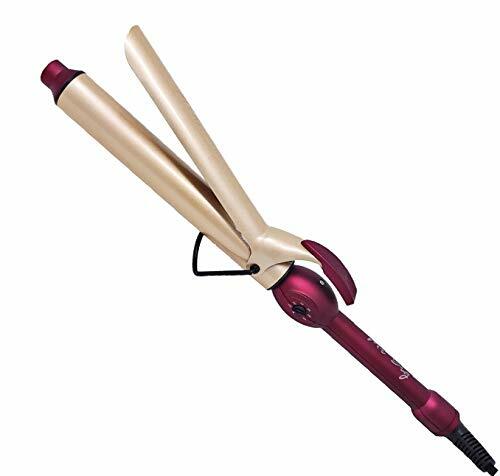 It has a nice ceramic coated barrel that distributes its powerful heat evenly so it avoids creating split ends and frizz too. To top it all it off it has a built-in 60 min auto shutoff for safety and a ‘big’ swivel cord for easy movement when you are using it. This is one of the most unique curling irons we have ever done a review on. It is actually many different curling irons in one thank to its 7 interchangeable barrels. That means no matter if you have short or long hair or if you want tight or loose curls you can do it easily with this hair styling product. It can be a little tedious changing out the barrels and learning how to use each one but once you do you will see just how versatile a hair curling tool the PARWIN PRO 7 in 1 Curling Iron can be. Among its nicer features are heat settings that can go as high as 450 degrees (stubborn hair does not stand a chance to resist curling at higher heat) and an all-digital temperature control. 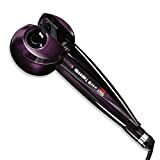 Its ceramic barrel is tourmaline coated so it heats evenly and greatly reduces ugly frizz and split ends. It’s a dual voltage device too so you can take it anywhere in the world with you and its generous sized 8-foot power cord is on a swivel so your movement is not restricted at all when using this curling iron model. Even a styling glove is included to help protect your hand from contacting the ultra-hot curling barrel as you are using it. The tourmaline ceramic curl chamber draws hair in, curls it for you with its brushless motor. And releases hair that is free from tangles and frizz but full of shine. It has 2 heat settings up to 400F, 3 timers with sleep mode, and a beeping function that lets you know when each curl is ready. No doubt, Hot Tools have produced one of the best products for long hair to get large, soft curls that don’t take away volume. It uses Pulse Technology on its 24K gold-plated barrel, which means that once it’s hot, it stays hot all over. The temperature is adjustable and goes up to 430F. Any heat loss is quickly restored without you having to worry. It has an easy-grip handle, 2 replacement springs, 8-foot cord that won’t tangle, and one-year warranty. 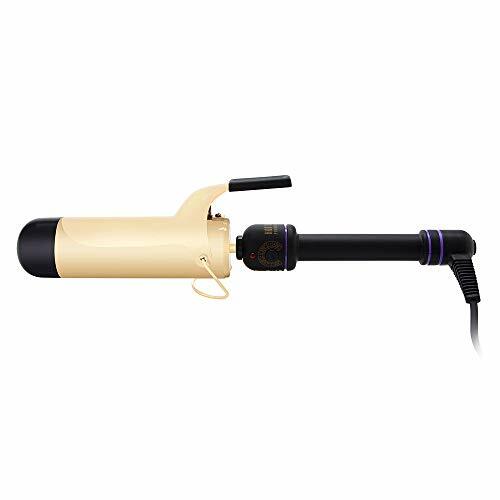 Part of the pearl-infused line, the wide ceramic barrel heats up in 30 seconds to 410F with variable digital controls and a cone shape for many choices between the style of your curls. It features a 60-minute auto shut-off and includes a heat-resistant glove. Even with the new short hair craze that is going around there is still many who prefer to leave their hair long and luxurious. Adding a little curl to your long hair will make it really stand out and look great. Therein lies the problem though, long hair can be very difficult to get to come out looking good when using a curling iron on it. To make this process go smoother there are a few things you need your curling iron to have in order to make loose or tight curls in your long hair that come out looking perfect and hold up throughout the day. Not everyone’s hair reacts the same way at the same temperature. That is probably the case with your hair too and that means you will want a variety of heat settings to choose from. Curling irons that have multiple heat settings will allow you to experiment with these different settings until you find one that curls your hair effectively and does it fairly fast too. This will give you a big advantage over more conventional curling irons that have only one heat setting to work with. 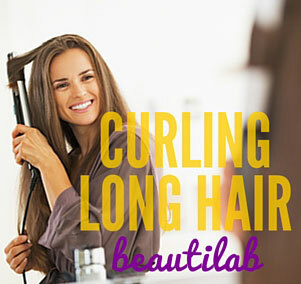 When you have long hair and you want to curl it, you don’t want it to consume a whole lot of time each day. That is why a thicker and longer barrel is desired by people with long hair when they buy a curling iron. 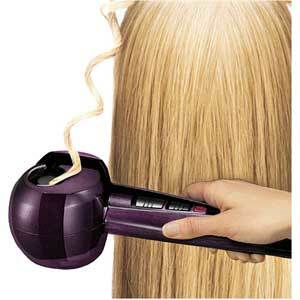 It catches and curls more hair on each pass and therefore reduces the time it takes to curl your hair. The best curling irons are not ones that have plain metal barrels but ones that have coated barrels. These are usually made of titanium or ceramic coatings. If you have stubborn long hair you will love the high heat of a titanium barrel as it softens your hairs resistance to curling. Ceramic barrels are great for curling normal or fine long hair because they distribute heat evenly and help keep it from getting damaged at the same time (tourmaline coated ceramic barrels work even better on longer hair). Many people think that when you curl long hair you can’t damage it as easily because you are working far from the sensitive roots. That is hardly the case and long hair is subject to all the same types of damage that short and medium hair is too. That is why built-in negative ion technology is a big bonus when it comes to curling longer hair. If you select a curling iron model that has negative ion technology you are taking a big step up in hair damage protection. That is because negative ions when infused into your hair as you use your curling iron cut down on your hairs natural resistance and make it easier to style. This technology also cuts down on the chances your hair will get split ends or become frizzy too. Before you do anything to your hair, make sure to choose the right styling products, from shampoo and conditioner, to anti-frizz and/or heat-protecting spray. We cannot stress the importance of both good products and prep work enough. It will keep your hair looking shiny and youthful as long as possible. Make sure that you choose products that work well with heat and that are not heavy because long hair can easily be weighed down. To top it all off, pick a finishing shine or hairspray that will fight humidity and offer hold for your curls. With wet hair, spritz with a heat protectant spray or gently rub a heat protectant serum through your stands. Dry hair completely. Begin by towel drying as much as possible first, and then switch to a hair dryer. Use a medium heat first, then switch to high at the end to minimize the amount of heat on your hair. More heat is coming next, after all! Use a small amount of your heat protectant spray or serum one more time before applying the direct heat of the curling iron to your hair to add an extra layer of protection to your cuticles and prevent split ends. Section the majority of your hair into one big piece at the top. Begin by working at the back and slowly letting out small sections at a time as you curl. What is the Best Way to Curl Long Hair? They can seem less familiar than traditional flat irons or curling irons, but don’t let the look fool you. They’re quite easy to use if you follow these steps. Start with the first section at the back and clasp the iron to the hair about an inch or two from the base. Instead of moving the iron and the hair themselves, simply press a button that gives the iron the go-ahead to start curling on its own. 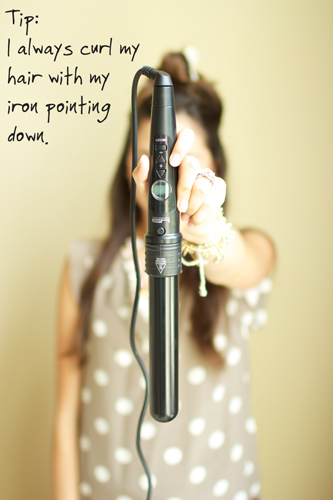 Let the iron do its job by winding hair around the barrel for you. Press the next button to release. 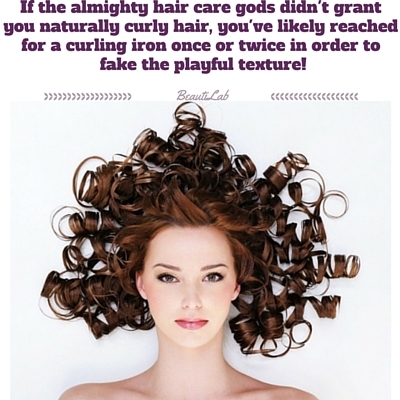 Curls will fall out loosely and naturally, completely free of tangles. Continue to the next section, always holding the iron still and letting it work on its own. Since your hair is already long but especially long in the back, you might want to start the heat about halfway down each section and curl just this part. It will help maintain your natural length since curls make hair appear much shorter. It will also prevent damage to hair that doesn’t need to be curled or touched with heat anyway. If you have bangs, this type of iron is not necessary. A simple blow dry in the right direction with a round brush will do the trick. When finished, give your hair a gentle shake with your hands or a light brushing for waves. Finish with your chosen shine or holding spray. The work of a curling iron is all in your thumb. This will prevent the heat from sitting on any section too long and will ensure you never get those horizontal lines. Just one to two inches from the root of each section, wrap the hair around the iron and allow the clamp to hold the hair in place. Use your thumb to pump the clamp a few times as you pull the iron through the hair toward the ends. Once you’re at the end of each section, give the hair a little curl back up toward itself to curl the ends completely. You don’t want straight ends sticking out. When each curl falls loosely, give it a couple seconds to cool before moving to the next pieces. If you have bangs, turn the iron facing upward and lightly brush the iron while half open away from your face. This will give you side-swept bangs. For bangs that face forward, turn the iron horizontally and do the same, not clamping down on the iron completely. If you don’t have bangs, curl the front sections either inward toward your face for more glamorous waves or outward for a more effortless curl that doesn’t fall in your eyes. Gently brush your waves for that uniform look or use your fingers to style and break up the curls. You can also flip your head upside down and shake gradually before applying the finishing spray. With a curling wand, one hand will always be holding the iron and one hand will always be wrapping. Since your hand will get awfully close to the heat source itself, consider using a protecting glove. Starting at the back, hold the wand an inch or two from your roots, and wrap one section in a spiral motion all the way down the barrel. If hair faces in the same direction around the barrel, your curls will look more uniform. To contrast, this, twist the hair as you wrap at the same time. The wand and the curl will fall away naturally as you let go with the hand that’s holding the hair. Continue with each piece all the way up to the top of your head, choosing larger or small sections of hair as you please. Bangs are a little trickier with a wand, so try your hair dryer and a barrel brush instead. Give your hair a gentle finger-combing when finished and mist with your favorite anti-frizz or holding spray. Sometimes life’s events simply call for perfect curls. But how are you going to get them? Whether you want the familiarity of the big round traditional curls from a curling iron or the ease and quickness of wrapping your hair around a clipless wand or are ready to try your hand at a new self-curling iron, you must try one of these three. We’ve searched high and low for the best of the best curling irons for long hair. You missed one – the VERY best curling iron for long hair is the one that has the longest barrel. It’s called the Mr Big Curling Iron! It was featured on HSN and in Good Housekeeping magazine. It curls long hair so much quicker than the others! Hello Anne! We will definitely consider this in our new coming list!